As someone passionate about travel and the travel industry, I pay a lot of attention to sites that are out there. Travel has long been an active industry online, whether you talk about people’s behaviour with increasingly booking travel online, or the slate of review and opinion sites that let people share their opinions about travel destinations. From Yelp to Driftr to Dopplr there are new travel sites that let you do just about anything you want and they are all great … yet none have quite found the right formula to harness the one thing that travel enthusiasts like me all have in common: a passion for talking about travel and sharing my experiences. Sure, I could post a review on Yelp or publish my own travel blog – but what about something a bit more … substantial? Something that I get a bit more credit for. Travel magazines are usually substantial in that way because they do manage to capture the wanderlust that characterizes many travel enthusiasts and offer a real experience you can hold in your hands. The problem is, very few of them build on the great content being created by individual travellers online because they have a professional editorial staff to do it for them. 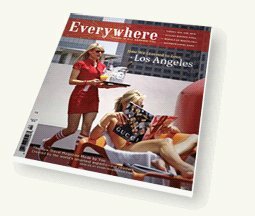 Everywhere Magazine is a publication composed entirely of user generated content. Every month, the editors select the best articles and photos (based on their editorial team and a system of voting on their website) and lay out a new magazine. This is brilliant for a number of reasons, but most specifically the costs they save on hiring a staff of writers and paying their expenses is put into the production of the magazine which is every bit as professional and beautiful as any other travel magazine likely to be on your coffee table. I joined the community and have several ideas for articles that I am just itching to write about, because they relate to places or things that I experienced and am passionate about, or tips for travelling better. Either way, it will be interesting to see if this model of a completely user generated magazine could work in other industries. Is this unique to travel because of the passion people have for writing and photography in this category, or could it work for any industry? Anyone seen other examples?